Mommy, Why Does The Hotel Tropicana Pool Smell Like Death? Ok, this is just gross. Sure, a death is involved and therefore tragic, but above all, it’s just nasty. Someone dies in their pool, and Hollywood Hotel Roosevelt basically does nothing. Happy swimming! They didn’t drain the pool! That’s beyond disgusting! 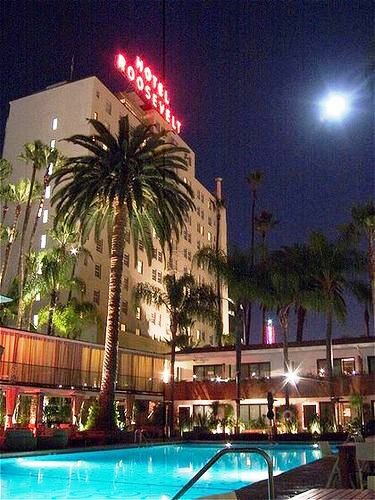 Last week there was a death surrounding the property of the Hollywood Roosevelt Hotel. Out of respect for the family, Thompson has not released the name of the deceased nor any private details. Unfortunately this morning inaccurate reports regarding the incident occurred. The death in fact was not pronounced at the Hollywood Roosevelt, it was pronounced away from the hotel, only after the individual was taken away by emergency medical staff in an ambulance. We can assure guests who have used the pool since the incident that proper procedures were taken, and the pool was drained and cleaned once authorities completed their on-site investigation. Thompson Hotels hope that journalists will respect the family during this time of loss and suffering, and share our deepest sympathies. Marilyn Monroe was a resident at the Hollywood Roosevelt for two years when her modeling career took off. Her first magazine shoot was taken on the diving board on the pool which was recently removed. Monroe stayed in suite 229 which overlooked the pool side. A mirror which once hung in her room is now in the lobby and is thought to be haunted by her spirit. A number of people also claim to have seen her ghost dancing in the ballroom of the hotel. Montgomery Clift, who lived at the Roosevelt for three months at one time, is said to haunt his old room, 928. People claim to hear him playing his bugle and see him walking the hallways of the 9th floor. previous post: Nick Hogan Released. What A Shame. next post: Jennifer Hudson Family Tragedy. A Hurt No One Should Know. I was a friend of Jordan’s and I believe that everyone should respectfully leave it alone. His family is having a hard enough time dealing with the death of their youngest son, they don’t need negative things written about him on tabloid websites. This is disgusting. I ALSO AM A FRIEND AND MUST AGREE WITH LISA. Do you have no sense at all? This man had a family and thousands of friends who are deeply saddened by the loss of such a great guy. Is it really worth it to plaster his name on your website just to get a few hits? You could have at least shown some respect and left his name out of it you @@@@ing @@@@s.. I will not let readers who call me names deter me from my love of gossip and writing about it. So say what you want about me, but it ain’t gonna change a thing! You could have told the story without using his name at all and got the same reaction from your fans……the person in the pool has no baring on the story!!! It was insensitive and his name can still be removed out of respect for his friends and family! I agree…. Jordan has nothing to do with the fault of the Hotel. His passing is a tragic reality for all that loved him and respected him. It is a blatant display of disrespect for such a great human being. It was a time to stop and think about his life and all he accomplished, and the lives that he touched. And his family and friends will forever be lost without him. His name is out there. And for me it is a name I will cherish…… If you knew him, you would have loved him, and respected his, and his family’s privacy. The fact is… it never falls close enough to home anymore. Love to you all, and all of us that know, he does not deserve this. I JUST KEEP THINKING OF THE OLD SAYING “WHAT COMES AROUND GOES AROUND” AND AT SOME POINT AND TIME IN THESE PEOPLES LIVES THEY WILL BE TOUCHED BY A TRAGEDY AND ONLY THEN WILL THEY UNDERSTAND THE DISRESPECT WE ALL SPEAK OF NOW. BUT ONLY TOO LATE! YOU SICKEN ME. HOW CAN YOU SAY THAT YOU ARE SENSITIVE TO THE NATURE OF THIS SUBJECT WHEN TO YOU-JORDAN IS NOT A PERSON BUT RATHER MONEY IN YOUR POCKET. YOU DON’T EVEN HAVE THE FACTS RIGHT. GET A JOB THAT MATTERS–THAT MEANS SOMETHING IN THIS WORLD. JORDAN LIVED A GOOD LIFE AND HE ACCOMPLISHED MORE THAN YOU EVER WILL. YOU MAKE ME WANT TO PUKE. YOU LOVE GOSSIP AND DEPLORE REAL LIFE. YOU ARE A SAD INDIVIDUAL AND YOU MAKE ME WANT TO PUKE. YOU ARE THE LOWEST OF THE LOW. YOU’RE PROBABLY A PALIN FAN TOO. First of all Sara, I am so not a Palin fan and if you read any of my other posts you would know that. Secondly, I don’t make much money with this blog. Thirdly, I have a real job – one that “matters” and means something to this world. Again, if you read any of my other posts you would know that. So say what you will and call me names in capital letters to make yourself feel powerful. It’s just fine by me. I know who I am, I know where I came from, and I know where I’m going. Oh, and by the way, I did not pass judgment on Jordan as you have just blindly done on me. You obviously have not read anything else I have written and therefore know nothing about me. But like I said, call me names and pass all the judgment you want – I’m still going to do what I do and say what I say. Death affects people in different ways. I’m sorry for the loss of Jordan’s life, in such a unique, if not deplorable circumstances. The loss of life is sensitive in nature, no matter if it’s someone famous or not. I feel Hilary has gotten an unfair comments, being called names. Have any of you who’ve posted uncalled for names read anything else on her site or written the same things from where she got her source? The name of her blog is “HOLLYWOOD GOSSIP” so try to take it with a grain of salt. In some instances it’s satire, but I don’t see where she has been disrespectful to the deceased. Respect or disrespect is subjective. As for his name being mentioned, if it’s out there on the internet, it’s going to be mentioned time and again, which is reality whether you like it or not. I suggest those of you with such strong ill feelings write the Thompson Hotel for their lack of action or concern for safety of others. This site is a blog on the internet, nothing more and nothing less. Why are so many of you taking it so personally and trying to censor its writer? Rest in peace, Jordan. Condolences to his loved ones and family. JORDAN WAS A MAN FULL OF PASSION AND PURPOSE…HE WILL BE MISSED BY ALL. HE TOUCHED A MULTITUDE OF PEOPLE AROUND THE WORLD. THE HOTEL SHOULD TAKEN CARE OF THE GUEST AND FAMILY. INSTEAD THEY WERE TREATED LIKE THEIR SON WAS NOTHING. ALL THE STAFF AND OWNER’S OF THE HOTEL SHOULD BE ASHAMED. YOU WERE LUCKY TO HAVE HIM STAY IN YOUR ESTABLISHMENT. Jordan was truly a blessing in my life.i lve in pasadena,ca where i met Jordan.i went to New York for my first time and stayed with him in Babylon.When i met Jordan it was like we had known each other forever.He touched my soul,heart,and spirit.Coast to coast we only had a few days at a time to spend together…i will always hold tight to the memories,the smiles,and the laughter and will forever know how lucky i am to have had his amazing heart and love shed upon me.i pray for Jordans friends and most importantly his beautiful family whom i’ve never met.